Before the development of synthetic materials, manufacturers relied on organic materials to make products. For toothbrushes, this meant sourcing and using the best bone and bristle available. “Pigs at a Farm,” Mid-Manhattan Picture Collection, New York Public Library. The bristle used to make an effective toothbrush has to be durable, soft, and stiff. Though other fibers were tried, boar bristle proved to be the best option. However, bristles from domesticated American and western European hogs were neither thick nor long enough. [pictured right] Furthermore, brushes necessitated long hairs with several years’ growth. Domesticated hogs were often slaughtered for meat before bristles they did have reached a length suitable for brushes. Instead, toothbrush makers throughout the 19th century relied on international trade in bristles taken from wild boars. The boar preferredfor toothbrush bristles came from the wilds of Siberia and China. After a boar was slaughtered, boiling water was poured on the skin and the thick, long bristles that clustered around its neck were scraped off. The bristles were then cleaned, combed, sorted according to size and bundled for shipment and sale in the United States and Europe. The bones used for toothbrush handles were most often those of domesticated cattle. 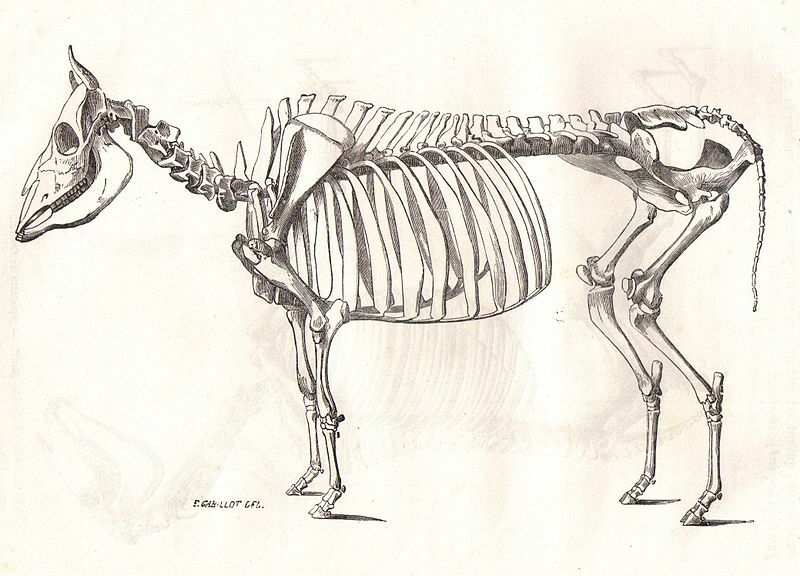 The highest quality brushes were produced from the femur (rear, upper leg bone) of the cow. Lower quality brushes were made out of the pelvic or rib bones. The femur provided not only stronger, straighter, but more toothbrushes than other bones. Savaging those bones proved to be a major source of income for the urban poor of the United States.